Aiga Forum, an Ethiopian forum for news and views promoting Ethiopia's Unity in Diversity! War Letters: From EPRDF to Derg! Amoraw and others captured during the same battle, the following interesting document alludes too, were ultimately killed by the military government of Megistu Hailemariam. We can only hope those who served the Derge and fled to Europe and else where in the North America's will look back and reflect after reading this story. We also hope the story will help the young generation to realize the current peace and prosperity in the country was the fruits of hard won struggle by people with big hearts! To memorize the known patriot, Amoraw , among the young generation groups. To create recreational opportunities to the people of the district and nearby communities. Derba Group, an amalgam of three Ethiopian companies owned by Saudi billionaire Mohammed al- Amoudi, said it plans to invest 59 billion birr ($3.4 billion) in seven industrial projects over the next five years. 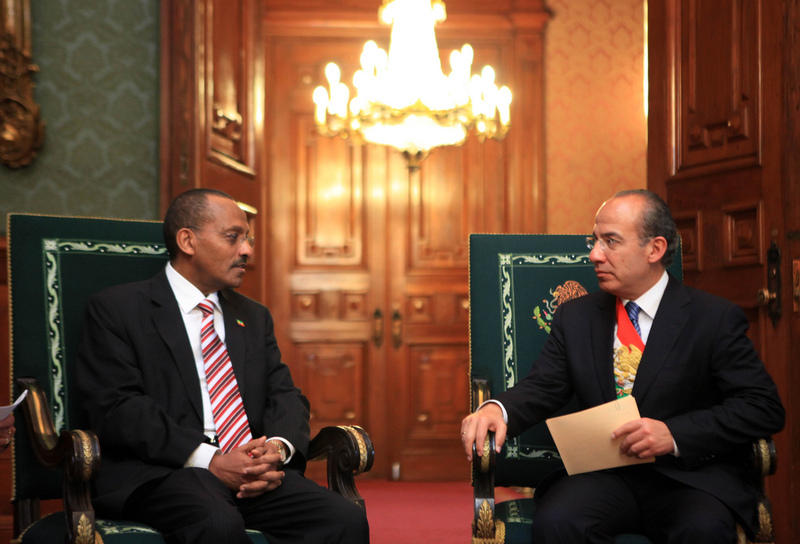 Ambassador Girma Birru Presents Credentials To President of Mexico! Tsehaye Debalkew, Washington DC, February 27, 2012- The newly appointed non-resident Ethiopian Ambassador to Mexico, Girma Birru presented his credentials to President Felipe Calder�n, the President of the United Mexican States last Friday February 24, 2012 at the presidential palace in Mexico City. A ship's anchor is to blame for Internet disruptions that could last days in six East African countries, according to a report. The anchor hit fiber-optic cables off Kenya's coast in a restricted area while the ship was waiting to dock in Mombasa, the BBC reports. Tough governments are able to get the most out of the rise in emerging-market interest in Africa. Here is one example of countries trying to get beyond the 'win-win' rhetoric in engagements with their Chinese partners. In Ethiopia Addis Ababa holds the reigns.During his August 2011 trip to China, Prime Minister Meles Zenawi visited the Pearl River Delta, where higher production costs are driving manufacturers offshore. SANAA, Yemen�Aides to Ali Abdullah Saleh said Monday that the ousted Yemeni president plans to go into exile in Ethiopia, as pressures mounted on him to depart the country for fear of sparking new cycles of violence. The news that the longtime Yemeni leader might leave to Ethiopia marks the latest twist in the meandering story of Mr. Saleh's fall from grace..
ADDIS ABABA, Feb 27 (BERNAMA-NNN-ENA) -- European aircraft manufacturer Airbus says it expects the Ethiopian capital, Addis Ababa, to become a mega city from the aviation perspective -- one which has more than 10,000 long-haul air passengers a day -- in the next 20 years. Richard Falk Richard Falk is the United Nations Special Rapporteur on Palestinian human rights. What motives are behind the US government's strong reaction to the arrest of NGO workers in Egypt? You have embarked on a long train ride in Africa. The train is in bad shape, the ride is bumpy and breakdowns frequent. You wonder when you will arrive at destination or if you ever will. But after a tortuous first half of the trip, the train is starting to gain speed. There are still a number of unnecessary stops but the destination is now in sight..
ዓምደኛ ወይስ የተቃዋሚ ፓርቲ አባል? RSADO, Press Statement:Jan 24th, 2012 ! The Deputy Mayor of Pingdingshan City visits the Ethiopian Embassy. Interview with Ambassador Seyoum Mesfin, on the occasion of the 37th TPLF anniversary! FrankFurt Ethiopian Community Lekatit-11 Event For Hedase! Ottawa Canada Lekatit-11 Event Invitation!